Today's post marks the last of a short series of four posts in which I deal with the last of the low value stamps of this series: the 8c Parliamentary Library stamp. Today, I will finish off the coil stamps with the tagged coils printed by the CBN and the booklet stamps which were included in 25c 50c and $1 booklets printed by the BABN. The basic content of this section is the same as that already covered for the 1c, and 6c stamps found in the same booklets, but I will adapt it with some pictures of 8c stamps and some changes to the sorting algorithm as it relates to single 8c stamps from these booklets. Today is the third of four posts dealing with the last of the low values of this issue: the 8c Parliamentary Library stamp. In this week's post, I will be looking at the printings of the sheet stamps that were Ottawa tagged. 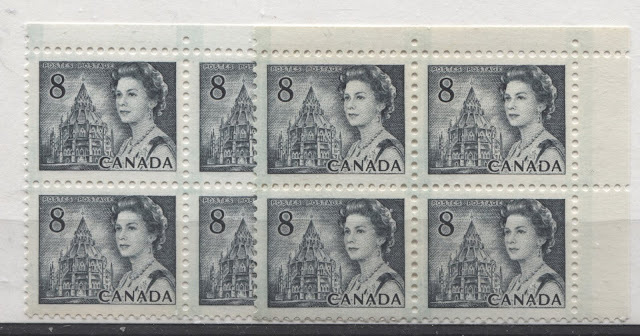 According to Unitrade, the sheet stamps were first issued at the same time as the Winnipeg tagged stamps, on December 30, 1971, using the then unstable OP-4 tagging compound. This compound migrated both through the stamps and onto any porous material they came into contact with. The result was that the tagging bars faded to the point that they were useless to the mail sorting machines, so that by late 1972, the taggant compound was replaced by a more stable OP-2 compound. 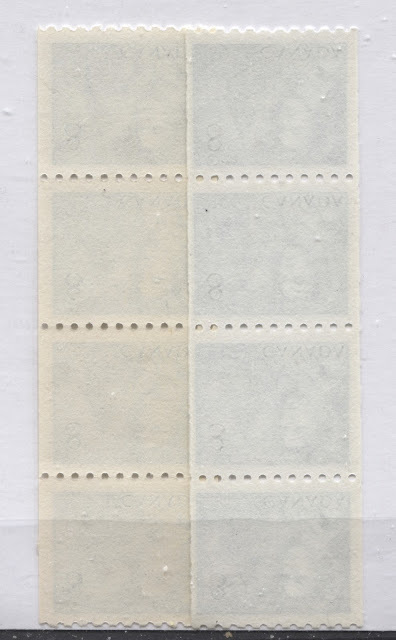 The new printings with the more stable OP-2 tagging were issued in 1973 between April and July, well into the period covered by the new Caricature issue that replaced this one, but before the release of the low values of that set.